As the project manager for Neighborhood Field Services, Shelby Graham is compiling what we refer to as the "Commercial Casebook", which identifies pivotal historic resources in Boston's neighborhood commercial districts whose preservation will contribute to their neighborhood's character and future economic growth. Shelby also seeks to build relationships with neighborhood representatives and property owners, giving them a link to HBI should they wish to pursue a redevelopment project or need technical support. After a year of this work, HBI has created a valuable compendium of historic commercial buildings in Boston's neighborhood commercial centers, which we hope will be useful to policy makers, property owners, local organizations and city-wide preservation leaders going forward. 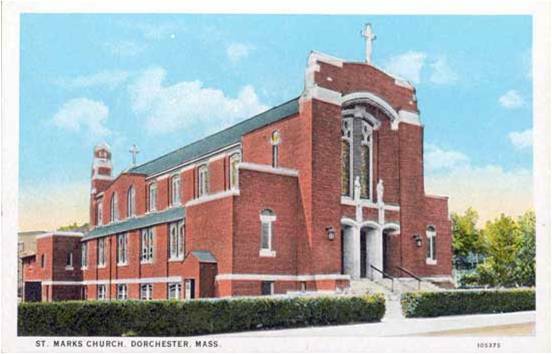 Over the summer, Shelby worked with St. Mark’s Area Main Streets in south Dorchester to pull together information about the district for Commercial Casebook and found a very interesting neighborhood with a range of different building types from distinct periods. St. Mark's Area Main Street includes a mile-long section of Dorchester Avenue that includes Peabody Square, the St. Mark’s parish campus and is also at times referred to as “Ashmont”. During the 17th century the area was part of the largely uninhabited Great Lots that occupied the vast section of Dorchester south of Meeting House Hill. Families such as the Pierces, Minots and Tolmans were among the few to settle in this area of pasture, forest and marsh land and their houses were located in the Neponset section, just south of Ashmont and Carruth Hills. Although Dorchester Avenue was laid out as a toll road in 1804, the Ashmont area remained generally uninhabited until the mid 19th century, despite the drastically improved transportation route. 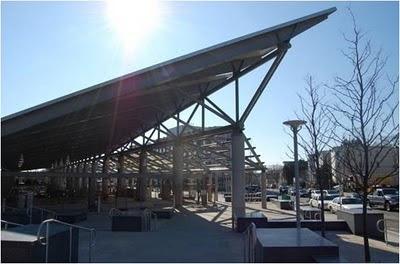 In 1870, a branch of the Old Colony Railroad was set out through the Peabody Square area, which finally led to a surge in population and development. The final two decades of the 19th century saw the first wave of stylish and ample homes being built on Ashmont and Carruth hills as well as the first substantial commercial buildings in Peabody Square. 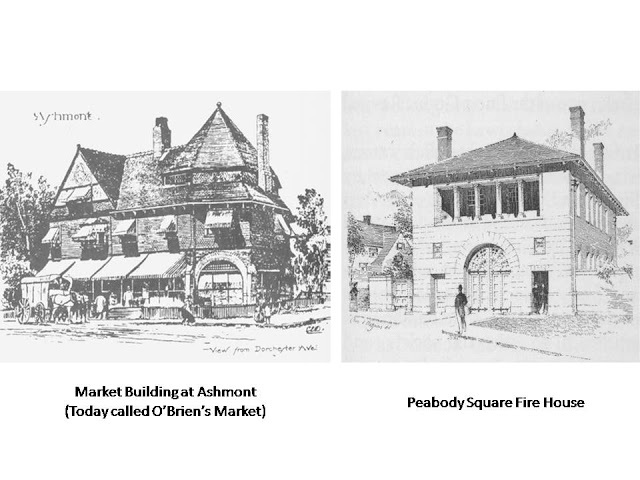 It was during this time that Peabody Square was developed into an emerging commercial district to support the growing residential population, with the establishment of a railroad station, a market, a hall, stables, a grand church and a fire station. 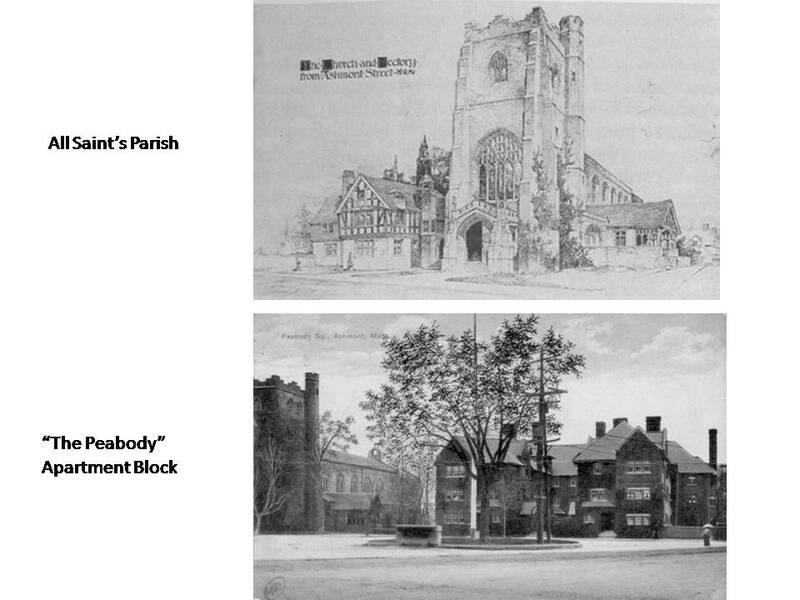 Around the turn of the 20th century, Boston’s Roman Catholic Archdiocese began to purchase land to build a new parish church just north of Peabody Square St. Gregory’s parish in the Lower Mills neighborhood (to the south of Peabody Square) was beginning to feel the growing pains of an expanding congregation and the Archdiocese set out to create a new parish to respond to the new residents in the area. A small wooden chapel was built in 1899 in that location. The parish, called St. Mark’s, built a large new red brick church building in 1914 (said to have been inspired architecturally by the pioneering All Saints’),which soon became the center of an expanding campus. A rectory, a school and a convent were added in the next few years. Between Peabody Square and St. Mark’s one can find a mixture of late 19th-century, 3-story mixed use buildings and one story multi-storefront buildings constructed in the first decades of the 20th century. Housing from a variety of eras punctuates the commercial structures. Lastly, Peabody Square has seen impressive new construction within the last five years in the Carruth Building and the new MBTA train station, which will soon be complete. • One story commercial/industrial blocks: found mostly north of Peabody Square, these one story commercial blocks were mostly built in the 1920s and 1930s. We will take you through these different categories next week on the blog: stay tuned!